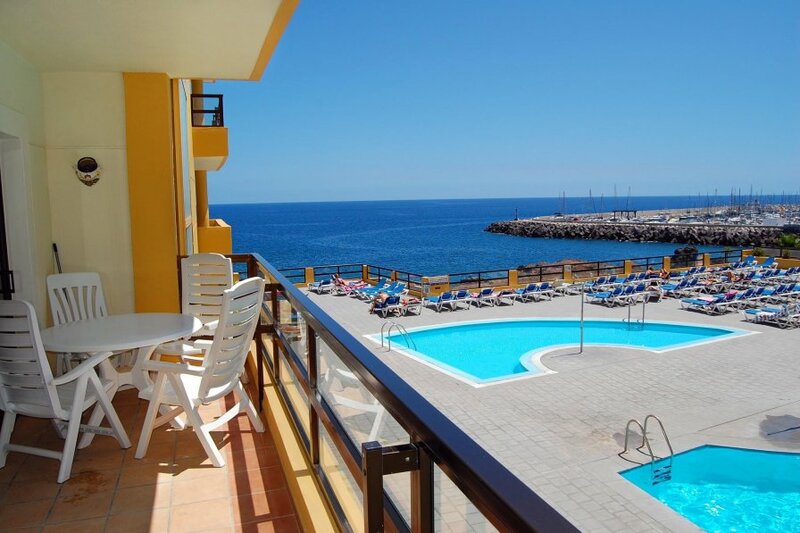 7846 Aguamarina- Lovely 1 Bed With Wifi Overlooking The Sea! Fantastic well situated second floor,one bedroom apartment in Aguamarina, Golf del Sur with large balcony overlooking the sea. Wifi. Exceptional views of the marina and pool area. This very comfortable 1 bedroom Apartment has one of the best positions in the whole area. With a large balcony that has stunning views over the pool and the Atlantic ocean, this is an apartment many people visit time and time again. With sea views from every room in the apartment and a balcony that literally sits over the Atlantic, you will be lulled to sleep by the gentle sounds of waves lapping against the shore! The kitchen is fully equipped with a full size oven and hob, microwave and fridge/freezer. There is a breakfast bar separating the kitchen from the lounge. The lounge consists a double sofa bed (that folds into two single beds), a radio/cassette/cd player, A DVD Player and Satellite television with BBC1, BBC2, C4 and ITV. There are patio doors leading to the large balcony. The apartment has it's own Wi-Fi internet access. The bedroom consists of twin beds, fitted wardrobes and a chest of drawers. It also has patio doors leading to the balcony. The fully tiled bathroom is extremely fresh and clean. A washing machine is provided in the apartment. The complex has lifts and is wheelchair friendly. The apartment also have it's own underground parking space. The Aguamarina Complex is very safe and secure as the main doors to reception are kept locked. It is very well maintained and each floor is cleaned every day. Within 500 yards there is a good quality gym, sauna, jacuzzi and beauty salon. The main resort centre area is a very pretty 10-15 minutes walk along the sea front. Here you will find a selection of shops, a supermarket, bars and restaurants. Bath with Shower, Wash Basin set in a Marble Top, WC and bidet. Washing machine. Table and 4 Chairs, Clothes Dryer, 2 reclining chairs / sun beds. Stunning pool and sea views. A heated adult and a separate childrens Swimming Pool, Outside Showers, Sunbeds, Views of the Ocean. 10 minutes from Airport, 15 minutes to Los Cristianos and Playa de Las Americas (by car). Hourly bus service also available to both the North and South of the Island. Taxi rank within 2 minutes walk. This apartment is looked after by a Local Management company. Wonderful pool and sea views from the balcony. The complex has lifts and is wheelchair friendly. The Pool is heated!